﻿This is another common attachment and again it is attached to the rear of the 2-wheel tractor, however it is not powered, it is merely pulled through the ground and for this reason the plough is not suitable for the smallest power unit (there is a choice of a single bodied plough or a reversible plough). A plough makes a channel in the soil that is called a furrow, the furrow width and depth can be varied, a plough is often used to ‘turn / invert’ the soil. Some times ploughed land is left fallow over winter, the winter weather then often breaks down the ploughed land prior to seeding the next season. By placing manure in the bottom of a furrow it is possible to bury the manure with the soil from the next furrow. 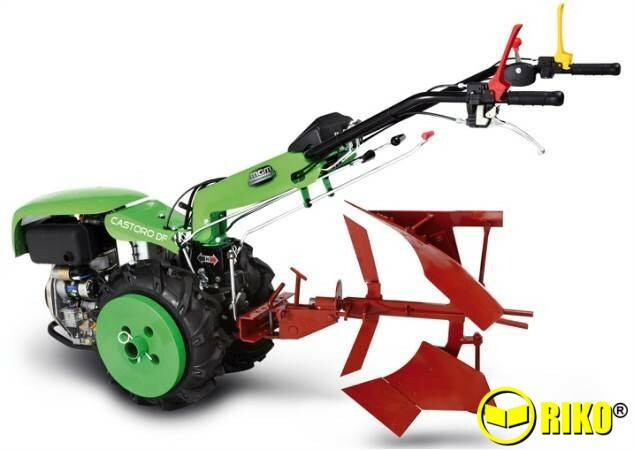 The reversible plough has two bodies, but only one is used at a time, it enables you to turn round at the end of a run and by switching over the plough bodies, they turn through 180º, you can ten plough a new furrow down the last run. With a single plough you have to return to the beginning of the last run or plough in what are called lands. The effectiveness of the plough relies very much on the grip / traction of the power unit, therefore if you need a plough the choice of suitable power unit and specification will be somewhat governed by soil conditions. The harder the soil conditions and the deeper you wish to plough then the more grip / traction you will require, therefore the overall weight of the power unit is worth considering. With all power units there are various wheel size options as well as metal ‘cage’ wheels and wheel weights, all of these can aid grip / traction.